Exactly a week ago, Scott Houston cracked open a fortune cookie at the end of his meal in a restaurant in San Jose, California. Surely, this message must be de rigueur in fortune cookies in Chinese restaurants around his office. This was, after all, Silicon Valley. Houston, however, kept the strip of paper, unfolded, inside his wallet. It was a foretelling of what was to come. For today, Microsoft announces it has acquired GreenButton and will integrate it into Azure, Microsoft’s public cloud offering. GreenButton provides cloud solutions for compute-intensive application. Its flagship product, GreenButton Cloud Fabric, is for enterprises and software vendors wanting to access unlimited computing power. Using the GreenButton SDK, applications can be cloud-enabled in hours with no recoding of existing software typically required. This will be the de facto standard, the way users access the cloud. GreenButton's customers include US-based companies Pixar, NASA, and Boeing. Microsoft NZ managing director Paul Muckleston states, “This is a clear indication that New Zealand is producing world-class, scalable technology solutions.” Microsoft declined to disclose the financial terms of the deal. "This purchase is a real shot in the arm for other New Zealand companies. It shows that if you take your ideas to the world stage, Fortune 500 companies like Microsoft might just notice. It happened to us, so it's entirely possible it could happen for other Kiwi start-ups,” says Houston. “As we develop globally, the key development will remain in Wellington,” he says. GreenButton also has staff in Auckland, the US and a contractor in the UK. This is a clear indication that New Zealand is producing world-class, scalable technology solutions. “It started with the Lord of the Rings,” during the filming of the last two movies from the Lord of the Rings trilogy," says Houston. Weta Digital had bought a thousand processors to manage the shots around the battlefield. “Having all that capacity left over, I founded the NZ Supercomputer Centre in 2004,” he shares. The NZ Supercomputer Centre was a partnership with Gen-i and Telecom. In 2006, he formed InterGrid, which provided computer processing for customers including software vendors. Houston says in 2011, the company was renamed, taking the title of its flagship product. Houston says they recognised they needed a global platform and partner and started working with Microsoft primarily from 2010 onwards. Houston discloses he had “doubts, lots of times” during the 10 years he and the investors and supporters were building the company. He says marketing the company in the US was another area they could “have definitely done better”. 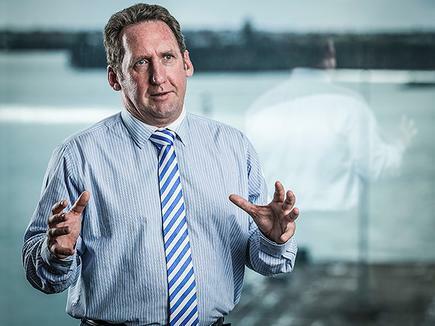 Houston says Marcel van den Assum, having left Fonterra as CIO, was one of GreenButton’s original angel investors. Van den Assum, is now chairman of the NZ Angel Association. “He has been a real voice of wisdom and mentor for me." Scott Houston says he is keeping the message from the fortune cookie for posterity. Because, as he puts it, GreenButton is not an "overnight success". CIO New Zealand has been tracking the ascent of GreenButton, starting from the time Scott Houston, then CTO of Weta Digital, founded the NZ Supercomputer Centre, to InterGrid, which was renamed GreenButton. On the leading edge From heading the technology team at Weta Digital to managing the New Zealand Supercomputing Centre, Scott Houston is relentless in his vision to be in the midst of major ICT developments of the day. Driven to lead Some CIOs are driven to become entrepreneurial, while others have had the responsibility of running a business “thrust upon them.” But all CIOs, who take the reins of a business, must be able to handle potential conflicts and risks. Supercomputers on the desktop Kiwi-developed GreenButton aims to revolutionise the way users access the power of cloud computing. Strategic 100 2010:Intergrid As cloud computing providers emerge around the world challenging the established order, New Zealand-based InterGrid stands out with its Green Button. The company says this enables users to access cloud computing services directly from their desktop applications. Wellington Angels invest in cloud computing venture InterGrid Green Button offering secures much-appreciated support. Every IT director’s fantasy Do you dream of an IT budget based on business need, of rolling out a series of successful projects and achieving ROI many times over? Wake up, you’re managing IT for The Lord of the Rings.